Drop 50+ lbs per year! Losing weight with aerobics is not just about jumping around a gym while an instructor guides you through a series of simple moves to get your heart rate up. Fine, that's fine but you can, run, walk, bike, ski...you name it as long as movements involved you're taking weight off doing aerobics. Find some old videos, although they are rather old, still give you a workout you can be proud you finished. So take a few minutes and try these simple aerobic moves and see if after you are done....your heart rate is up. You can burn at least 100 calories in a 20 minute session, simply walking at a bit faster than conversational speed. The greatest significance of aerobics is it can be done when dieting or without dieting and you still lose weight. If you don't at this time have a regular aerobic exercise to help you in your losing weight adventure...you must begin NOW! I think we all forget how vital exercise is to our health and happiness. Regardless of your size, weight or abilities, aerobic exercise is great for you. You can weight 300 lbs and have trouble walking for longer than 15 minutes and still do these exercises. 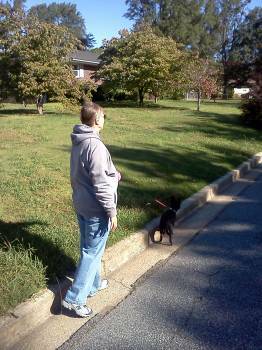 You're walking, and not just that, you are walking outdoors! All you have to do is prepare yourself to get moving, losing weight via aerobic exercise literally keeps you going. The hormones dopamine and nor-epinephrine secrete into your bloodstream and in a blink of an eye you're euphoric with more energy then you thought possible. And now aerobic outdoor exercise becomes a very easy way to lose weight. While exercising, you move large muscle groups in your arms, legs and hips. Since movement gets everything in your body excited you'll breathe faster and deeper. ...which maximizes the degree of oxygen in the blood. Your heart beats much faster, increasing blood flow to your muscles. Those small blood vessels called Capillaries widen in delivering more oxygen to all muscles. Blood flow carries waste: such as carbon dioxide and lactic acid out from the muscles to be absorbed in the liver and kidneys. Then eliminated in urine and feces. The body naturally releases hormones promoting an wonderful sense of well-being. aerobics warm-ups may help prepare you for aerobic activity. Warming up gradually revs you up. YOUR cardiovascular system will increases blood flow to your muscles and raises your body temperature. This way you won't injure muscles that haven't been moved a lot. Jumping into a workout without preparing your body could lead to problems which could prevent you from continuing your routine. 5 Aerobic Exercises that Melts the Weight off! 1. This is RJ and me taking our nightly walk. Instead of walking a normal walk, I am putting one foot directly in front of the other. As if I was walking on a tight rope. It serves 2 purposes: the first is it teaches my body supreme balance. The second is it tightens up my abs quickly and strengthens them without the soreness that accompanies sit-ups and crunches. And it's way more fun!! 3. Run/walk...where you run for 5 minutes then walk for 15minutes. As you get stronger you can run longer and walk less to where you are running 15 minutes and walking 5 minutes. You become much thinner faster losing weight via this form of aerobic exercise. One added bonus when dieting this way: nor soreness and you can build at your own pace. 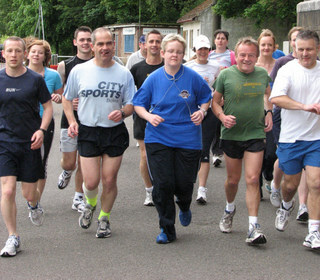 Start walking/running club and have some fun with it. 5. Climbing bleacher at the local high school. All you do is walk up and walk down. You start out with 5 up and 5 down. Increase as you feel stronger. A super quick way to lose weight without killing yourself. 4. You might think horse back riding isn't aerobic and losing weight with this form of exercise is a lot of bunk!! When I was young I spent hours in the saddle just practicing to be the best rider I could be. which at that time way size 10-12. 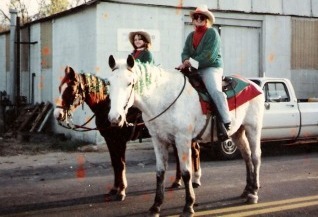 That's my daughter and me back in 1992 getting ready to rid in a Christmas parade. Each week you need to add 1 or 2 complete rounds up and down. Losing weight with stair climbing aerobics will have 40-50 lbs off you in 6 months. You just have to become consistent at exercising and losing weight becomes something that just happens .